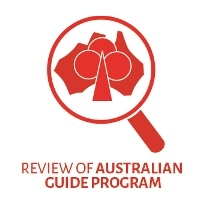 In 2014-15 Girl Guides Australia (GGA) conducted a comprehensive Review of the Australian Guide Program (AGP). This was an important part of ensuring that Girl Guiding is responding to the needs and interests of girls in today’s Australian community. As part of the Review, GGA commissioned research on girls’ learning, the value of a girls-only organisation, leadership and volunteerism. GGA also consulted adult and youth members, and parents about their experience of the AGP – and asked what was working well and how we could improve. The AGP Review is complete and in November 2015 the Board of Girl Guides Australia endorsed the recommendations of the Review and a strategy, developed by the National Program Team, to take these forward. GGA sends a very big THANK YOU to all those Girl Guides, leaders, parents and supporters across Australian who put their time, energy and feedback into this Review! Building Our Future – a set of six projects that will carry forward the recommendations of the AGP Review – was launched in February 2016. For more information about Building Our Future go to the webpage here.